Here you will learn why dental photographs are crucial and which tools and instruments are available to assist you. Here is a review of techniques used while taking dental photographs in a studio environment with analysis of the final result. 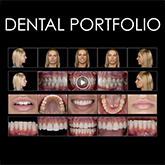 How long should it take to create a portfolio alone or with an asssistent in your office? Check it out! A demonstration of two basic shots needed for Digital Smile Design: the front view and the 12 o’clock view. Concentrating on positioning of the head and camera.